The Saucy Soarin' Slop Copter! * Really Flies with Turtle Aboard! * Radical Rip-roarin' Ratractin' Pizza Pull Cord! * Side-swippin' Pizza Loaded Machine Guns! * Wipe-out Resistant Windshield! * Fits . 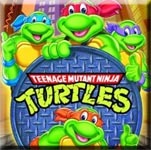 . .
* Four Finger Flick Turtle Head Missiles! 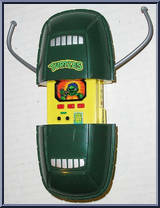 * Detachable Sewer Shark Torpedoes! * Fits One Turtle Dude! * Pizza Cutter Missiles! 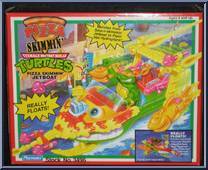 Hop aboard and cast off on the one and only Pizza Skimmin' Jetboat - the. . .